Clare joined the firm in January 2016. Having graduated from the University of West England in 2011 with a 2:1 degree in Criminology and Philosophy, in 2012 Clare returned to education taking a 4 year part-time CILEx course at Coleg Gwent. In August 2016 she qualified as a Legal Executive and in January 2018 she attained fellowship. Thus qualifying as a Chartered Legal Executive. Clare currently works in the Criminal Department at our Newport office and is also qualified as an Accredited Police Station Representative. 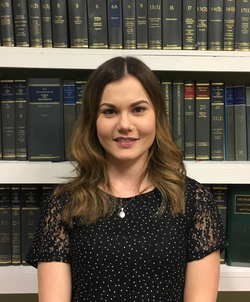 Following this, Clare intends to undertake her advocacy training and eventually join the Criminal Litigation Accreditation Scheme, enabling her to be a fully qualified member of the Duty Rota Scheme. Clare enjoys poetry writing, badminton and walking.